Our nephew Luke is learning how to talk. He shows off his new words for us when they Skype us from my in-law’s house – he says “strawberry” and “Dot” (Scott) and “tigers say GRRRRR”. Allegedly, he has said “Christine,” although not when I’m around. He says “good job” because that’s what we all say when he does something we like. He gets a lot of “good jobs” and applause; he just beams at us beatifically while we congratulate him for, say, trying to use a spoon. We all think he’s pretty adorable. The biscuits I grew up with were not the archetypal “Southern” biscuit. I’m actually planning to talk about them in a separate post in order to better explain both types, but the main difference was in using oil rather than shortening, butter, or some other kind of solid fat . I’m more familiar and comfortable making biscuits from the recipe my mom taught me but I also love flaky crisp buttermilk biscuits, scones and other “pastry” style quick breads (and by “pastry”, I mean gently incorporating a solid fat into flour to make a light, flaky quick bread, in contrast to what I’ll call a “quick bread” method in which a liquid fat like oil is used to make a moist, soft and usually denser bread like fruit bread or tea bread). And in that respect, Janice’s “Good Job” biscuits are hard to beat. They are a light crisp biscuit with a buttery golden top and just a suggestion of buttermilk flavor, a nice little duvet for a pink curl of salty country ham to cuddle up in. I got some really nice country ham from Scott Hams in Kentucky. When you call them, Mrs. Scott answers the phone, takes your order, and is happy to answer any questions you might have about the hams her husband has been curing on their farm since 1965. The only modifications I made to her recipe were, first, not using White Lily flour which cannot be had for love or money in New Jersey and for which I wasn’t prepared to wait until I could import a sack of it from southern climes and, second, I used Spectrum Organic All Vegetable Shortening instead of Crisco. This choice harkens back to my upbringing; while I’m far less strict about my diet now than my mom was, I have retained an aversion to heavily altered “food-type products”. I just can’t do it. Not that a non-hydrogenated shortening is a health food – it just seems less weird to me. Anyway, that’s how I cook. Mix the flour, baking soda and confectioners sugar. Cut the shortening in. 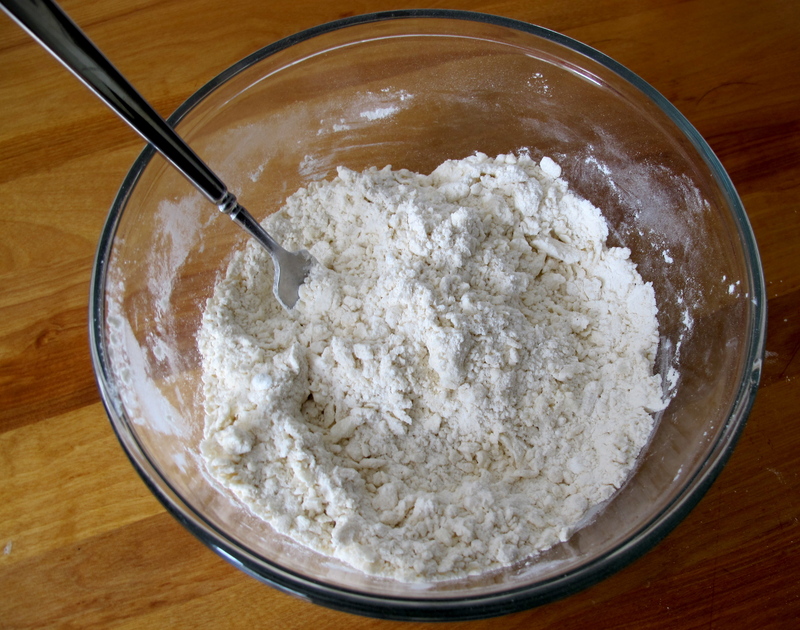 I use a fork to blend in the shortening and really, the important thing to remember is to do as shoddy and unthorough a job of mixing the shortening into the flour as possible. Don’t try to make it all nice and even; it just makes the biscuits denser. Pour in the buttermilk and stir it in just enough to moisten the flour mixture. Using your hands, knead the dough a couple of times, just to get it to pull together into a ball. Again, this is a recipe that insists that you put your feet up and do as little as possible to the dough for best results. Put the ball of dough on a lightly floured surface and gently pat out into a square about 1/2 inch thick. I like to make my biscuits square. It alleviates the necessity of reforming and cutting the dough that circle cutters leave. 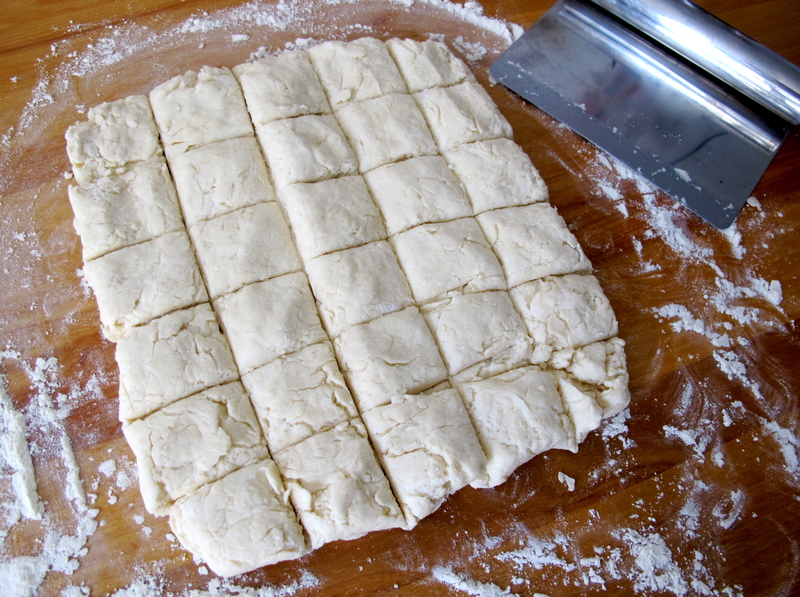 Using a bench scraper or long knife blade, cut the dough into squares. Place slightly apart on a baking sheet or stone and bake for about 10 minutes until the tops are golden. Brush with melted butter. Serve hot. I think the Spectrum organic shortening tastes way better than Crisco, and it has a better texture — more solid and substantial, like lard. So it’s not just a health thing. I agree- I’ve been using it in pot pie crust and have never made better. 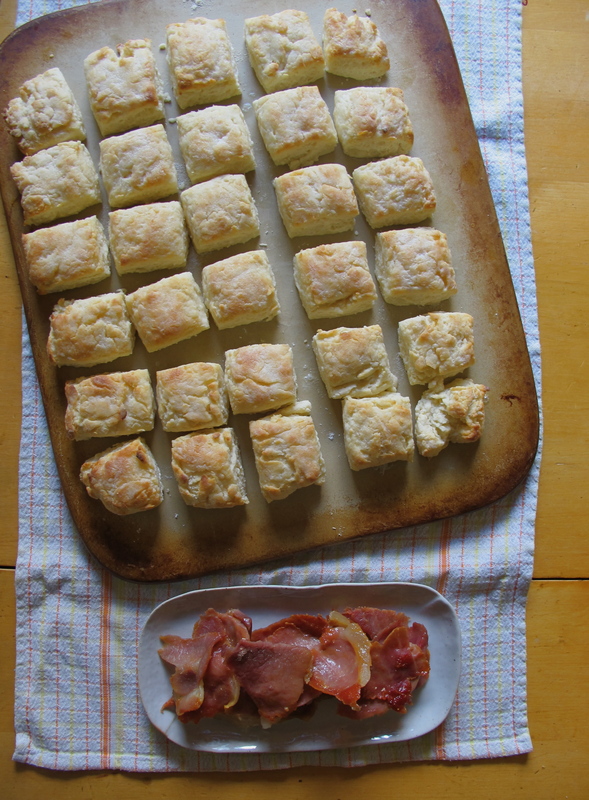 They look lovely, but isn’t the ratio of pork to biscuits in that photo backwards? I use various duck and pork fats from my little hoard of jars in the fridge plus butter in mine. Shortening freaks me out.